On a bright, but chilly January morning, Senior Master Sgt. 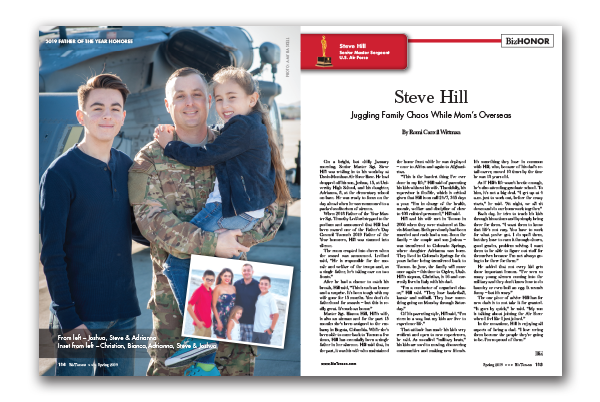 Steve Hill was settling in to his workday at Davis-Monthan Air Force Base. He had dropped off his son, Joshua, 15, at University High School, and his daughter, Adrianna, 8, at the elementary school on base. He was ready to focus on the day ahead when he was summoned to a packed auditorium of airmen. When 2018 Father of the Year Master Sgt. Timothy Ledford stepped to the podium and announced that Hill had been named one of the Father’s Day Council Tucson’s 2019 Father of the Year honorees, Hill was stunned into silence. Master Sgt. Bianca Hill, Hill’s wife, is also an airman and for the past 15 months she’s been assigned to the embassy in Bogota, Columbia. While she’s been able to come back to Tucson a few times, Hill has essentially been a single father in her absence. Hill said that, in the past, it was his wife who maintained the home front while he was deployed – once to Africa and again to Afghanistan. “This is the hardest thing I’ve ever done in my life,” Hill said of parenting his kids without his wife. Thankfully, his supervisor is flexible, which is critical given that Hill is on call 24/7, 365 days a year. “I’m in charge of the health, morale, welfare and discipline of close to 400 enlisted personnel,” Hill said. Hill and his wife met in Tucson in 2006 when they were stationed at Davis-Monthan. Both previously had been married and each had a son. Soon the family – the couple and son Joshua – was transferred to Colorado Springs, where daughter Adrianna was born. They lived in Colorado Springs for six years before being transferred back to Tucson. In June, the family will move once again – this time to Ogden, Utah. Hill’s stepson, Christian, is 16 and currently lives in Italy with his dad. That attitude has made his kids very resilient and open to new experiences, he said. As so-called “military brats,” his kids are used to moving, discovering communities and making new friends. It’s something they have in common with Hill, who, because of his dad’s retail career, moved 10 times by the time he was 10 years old.